Is your pet a fussy eater? 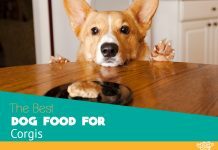 No worries, here is the roundup of the five top rated dog food choices for picky eaters that will make your puppy munch every drop you give him. It’s suppertime for Barney, and you put his latest favorite meal in his doggy dish. He sniffs it and looks at you with those big soulful brown eyes. Then he nudges his bowl with his nose and sits with his back to you, what’s his problem? You start to worry that Barney isn’t feeling well, doesn’t like his new food anymore or is just being difficult. Now it’s true that he’s always been somewhat picky when it comes to meals, but lately, Barney has gotten worse. He might eat the new stuff for a couple of days, but then he turns his nose up at it a week later. What’s worse, you’re thinking “why my dog won’t eat dry food anymore?” The only good thing out of having the various cans of unopened dog rations piled up in the cupboard is that the local rescue shelter is going to be benefitting. So now you’re curious if there are even pet vittles for fur babies who are fussy eaters. After all, when Barney goes on an “I’m not gonna eat that!” strike, you wonder what you are going to feed him. But don’t worry, here’s a list of recommended and tasty foods for picky dogs. Rachael Ray isn’t just a talk show host and famous chef but is also an animal lover. She has developed a pet food called Nutrish which uses ingredients from farms in the United States. It’s one of the most delicious dry dog foods. Nutrish is made from 100% protein such as farm-raised chicken. The gives Nutrish a flavorful, meaty taste that your dog will love. Additionally, there are meat fats added for a natural, more intense extra flavor. Plus, each variety has veggies, like carrots and peas, included in the food. 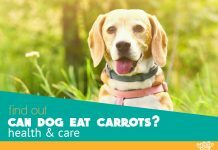 These veggies are in the canine cuisine to satisfy the plant’s based tastes which dogs who are picky enjoy. Because Nutrish is a natural grain-free and natural with quality ingredient and intense flavors food, it’s a dog delight that picky dogs will run to their dish. It doesn’t have fillers and is gluten-free without colors, artificial flavors or preservatives that are artificial. This natural pet food has chelated minerals and added vitamin for your four-legged companion’s good health. The only issue with the Nutrish Zero Grain Natural Dry Dog Food is that it doesn’t come in a re-sealable bag. So, I would advise putting it in a container with a lid to keep it fresh. This product is high in nutrition because it uses real animal protein. It also has scattered throughout the grain-free kibble, pieces of freeze-dried raw meat. This combination makes for a diet rich in nutrition to keep your furry friend’s digestive system in working order. The ingredients are all natural without artificial colors, preservatives or flavors. There are vitamins and minerals added along with it being gluten-free and grain-free. Plus, there aren’t any fillers of wheat, corn or soy. Also added are Omega 6 and Omega 3 fatty acids which help your canine develop a shiny and soft to the touch coat. Also, to help support a healthy immune and digestion system, antioxidants are mixed into the blend. The mixture is a complete balanced meal for all stages of your dog’s life. These include the life stages of being a puppy, adult, and senior; and it’s ideal for all dog breeds. However, you may think this food is a little on the expensive side if you’ve been feeding your pet the cheaper stuff. The size of the kibbles will accommodate small to large breed dogs comfortably. 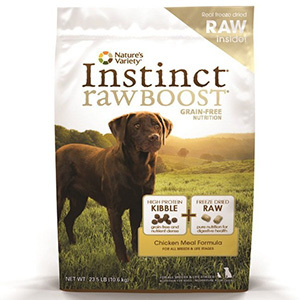 Also, Nature’s Variety Instinct Raw Boost is the Best Friends Animal Society official pet food. This animal rescue feeds over 1 million meals to dogs annually in their adoption centers from Instinct Pet Foods. Complete diet pet meal and will satisfy the needs of picky ruffs, puppies, and even pregnant dogs. The recipe created with free-range chicken, plus primary produce from the garden. These ingredients combined with organic whole grain barley is what makes each bite a delicious treat. The time-tested method of preserving by dehydration is the method which is used to create this healthy dog nourishment. The dehydration process for this dog food removes moisture from the food when processed while leaving all the vitamins and minerals. Because real lean meats, fruits, and veggies are used, which means mixture loaded with everything your pet needs in the diet. You should adjust the amount of water added to see if your dog likes it soupy or more textured. It’s even graded 100% for human consumption. It means that it’s made from the human food chain and even processed in a facility which makes human food. Plus, when pets eat the right stuff, their skin doesn’t itch which means that they’re not scratching, and they don’t get upset stomachs. These problems show up most of the time from pets eating nourishment that is processed. So, if you’re saying “My dog won’t eat dog food, only human food” then this is the dog food to choose, plus it’s a vet recommended dog food. A great meal for maintaining your furry friend’s weight and keeping his joints healthy. It also has the optimal levels of fat and protein with natural sources of chondroitin and glucosamine. It’s chock full of nutrients, is flavorful and offers complete nutrition. A network of trusted farmers and suppliers are responsible for the natural ingredients. What this means there aren’t chicken by products, artificial flavors, preservatives or soy added. The chicken and Salmon which are used in this product varieties are raised without adding hormones or antibiotics to their diet. It’s also perfect for dogs with allergies since it’s made from natural ingredients and excludes corn and soy. So it’s a balanced and complete cuisine for puppies, nursing mothers, adults, and seniors. If your senior companion has early stage kidney disease, the little phosphorus used in this mixture won’t cause problems either. The reason phosphorus is in dog food is to promote bone growth. With the variety of flavors, if your dog has an allergy to poultry, the salmon would be perfect. It can help allergy symptoms improve or disappear entirely. Additionally, because the scent of it is so delicious, it can perk up an appetite in an older senior who may be getting finicky with his eating. It’s also a vet recommended dog food. You can feed your furry friend two ways with this food. You can add it to regular kibble as a flavor boost. 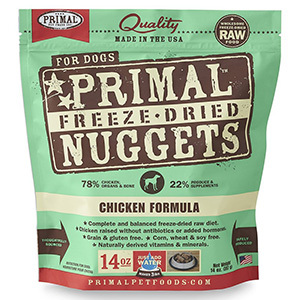 All you do is take some of the freeze-dried nuggets, add water; mix it and add to the kibble. Or you can just feed it to him as the main dish. With all the freeze-dried meat proteins, it is sure to entice your picky eater. Also, this product just doesn’t have meat but also healthy additions. These additions are seeds, plants, organic veggies, fruits, carrots, apples, and kale. Plus, each nugget contains vitamins, minerals, and antioxidants, so your fur baby who “turns his nose up at everything” has everything needed for a healthy diet. Older dogs who have trouble chewing may appreciate these vittles because you can add water to it which helps them with their chewing. This product is a complete diet for puppies, nursing mothers, adults, and seniors. It’s gluten, corn, wheat, grain and soy free. Also, the chicken doesn’t have added hormones or antibiotics and is formulated in the USA. The recipe is a great pet food for even the pickiest dogs. Because the demand for cheaper pet food is rising, pets are having a variety of health issues. The reason for this is because of excess calories and foods that are highly processed. The health risks may include arthritis, diabetes, cancer, obesity and periodontal disease. So what do you buy that’s healthy for your four-legged companion? Well, it’s easy. A diet made from a nutritionally balanced formula for all stages of life. It should meet the balance needed by pets for proteins, carbohydrates, vitamins, fiber, fats, and minerals. Feed-grade ingredients: These ingredients are a bone meal, grease, fats, and rendered by-products. Also, to kill bacteria in kibble and some canned foods, these are cooked at high temperatures. When completed, it destroys beneficial enzymes and proteins similar to when you over microwave your meals. Chemicals and Preservatives: Three nasty preservatives used in treats and pet food are Butylated Hydroxyanisole (BHA) Butylated Hydroxytoluene (BHT) and Ethoxyquin. The first two added are preservatives for fats. Ethoxyquin is not put in food for human consumption but is often added to animal products. Propylene (PG): This is to help to keep food moist and added in soft treats and soft dog food. It’s the same chemical found in anti-freeze. PG is said to be non-toxic and won’t be absorbed by Barney, but why chance it in his main meal. Food dyes: Different types of food dyes have been known to cause allergic reactions, cancer and behavior problems in humans. Since coloring only appeals to people and not animals, finding something without artificial coloring is good here. Rendered fat: Yes, the rendered fat will make the meal taste better, but there’s a possibility that the fat can contain salmonella and toxins which are poisonous. If the bag gets damp for some reason, then mold and bacteria can develop also. So, why are some Dogs’ Picky Eaters? Many dogs will eat anything in their dish but also anything that hits the floor. Others may just push their fare around in their dishes until you give them something else. 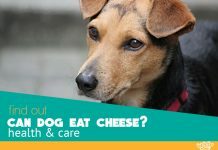 On the other hand, if your four-legged friend has always been a big eater, but he becomes a fussy eater suddenly, then there may be an issue. One concern is to make sure Barney is healthy then. If he’s lost weight or has started to vomit or has diarrhea, you need to call your veterinarian. Another issue may be a dental problem or a problem inside his mouth additionally. So Barney may have a bad tooth giving him trouble. Or he could have a sore, or even a foreign object in his teeth, or one that’s cutting his gums. Your vet can find out what’s wrong with his mouth, get him treated and then Barney should be his old self again. But if the problem isn’t due to health, then it’s something else. You may want to think about if Barney has picked up some bad habits. Maybe other people who live in your home are feeding him snacks, and you’re not aware of it, (young grandchildren are especially guilty of this). If he is getting table scraps, leftover mac, and cheese, or following a trail of cookie crumbs, it needs to stop. Barney will need a feeding schedule, and other family members put on notice. Another thing to consider is to check the expiration date on the stuff you’re giving him. It could be spoiled, so you need to smell it for foul odors. Store dry kibble in a dry location in a closed container. If it becomes wet or damp, you can have mold form. For wet food, save the left over’s in the refrigerator. I almost forgot, make sure that your pet has enough exercise and make sure to walk him or her at least 30 minutes every day. Lack of activity can be a major cause of loss of appetite. One of the best ways to keep your puppy fit and active is playing fetch. If you don’t have enough time, just grab one of the automatic fetch machines and it will do everything for you while you just watch and laugh (it gets funny). So, you’ve taken Barney for a health check, and he’s passed. You also checked the expiration dates on everything and cautioned everyone not to feed him snacks. But, he’s still finicky. So how do you make your finicky dog eat again? Well, there are some suggestions below which may help you get Barney to eat. First, be sure what you’re feeding Barney is a high-quality food. There are some healthy choices listed above if you want to check those out. So read the can or box of the brand and make sure that the main ingredient is meat. Wet or dry, it must be the main ingredient. Stay clear then of any bag or can that lists corn as its first ingredient. Next, buy a small bag of what you’re changing over. Slowly adjust it if you’re switching brands. Take a few spoonfuls of the old stuff and mix it in with the new. Over the next two weeks, put in less of the old and more of the new until it’s all the new. If you’re feeding canned food, you may want to warm it up in the microwave if it’s cold too. Warm food has a more enticing aroma. Another method is to limit the time he eats. Start a regular feeding time for Barney. Put the kibble out for about 15 minutes, then take away what he doesn’t eat. Discard what’s left and feed him again in about 12 hours and don’t feed him between meals. If he isn’t eating after two days, you can add a little broth into the dry or add some of the wet he was eating. It’s going to be difficult but be consistent and don’t give in. In conclusion, if your pet is picky, much like Barney, you can solve this problem. Just remember it’s important to buy the highest quality dog food for finicky eaters, like what’s listed above, with meat listed first in the ingredients. Also, if you need to change your four-legged friend over to dry instead of wet, try the hints listed. He won’t starve in the process of changing him over. Remember to remind other family members that treats and snacks are off limits until he starts eating regularly. The reason behind this is that if he thinks he’s going to be eating tons of snacks, then he won’t want to eat what you’re trying to feed him that’s new. He may be soaking up the attention you’re giving him when he isn’t eating too which will reinforce this bad behavior. So only when he eats do you give him lots of praise. Only give him encouragement and attention after he eats everything in his bowl. You could also walk your canine companion right before you feed him. This way he’ll associate walking with mealtime, plus he’ll work up an appetite. Above all, be patient with him. Consistency and time will help. Before you know it, he’ll be eagerly anticipating his next meal. 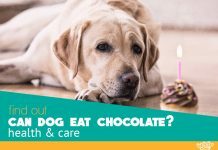 Can I Give My Dog Chocolate? Tasty Treat or Poison?